Is your desktop a dumping ground of random applications, files and pictures? Have you resorted to ignoring it and only dealing with it when you have to? 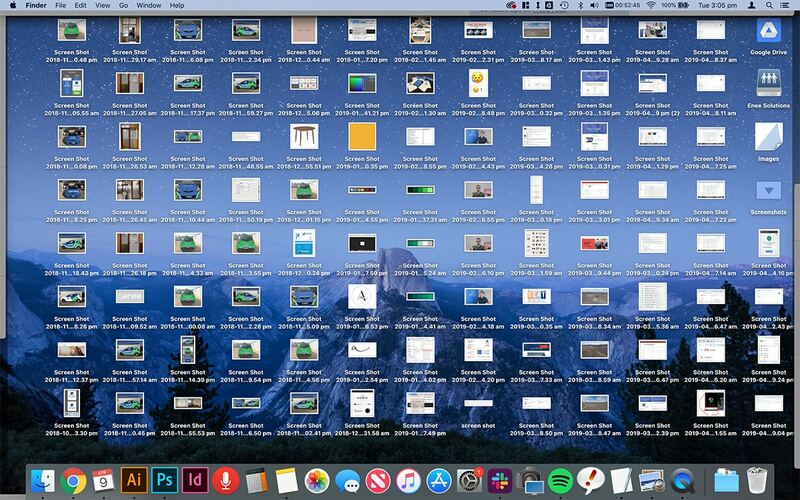 Well here are some tips on how to deal with this, from simply hiding files to taking charge of your desktop and becoming super organised – either way you’ll have a desktop that you’ll be proud to show the world! First, the easy (lazy) way. 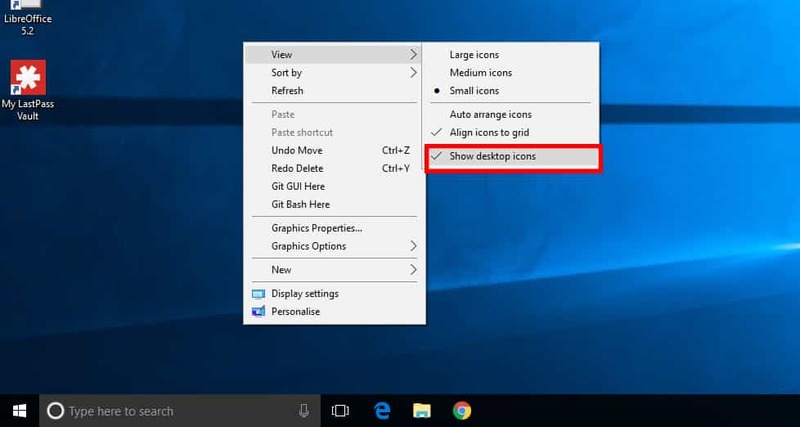 For Windows, simply right click on the desktop, click ‘View’ and then ‘Show Desktop Icons”. This should already be ticked, so clicking it again will untick the option and hide everything! For Macs you’ll have to enlist the help of an application called HiddenMe which you can get for free here. 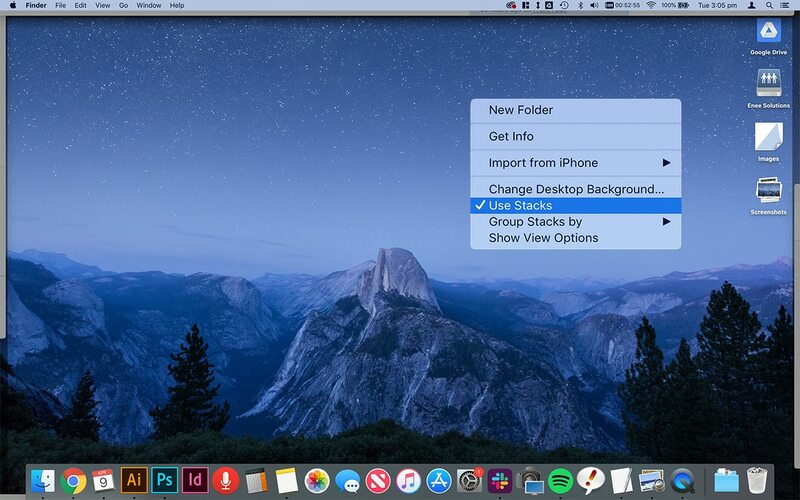 Alternatively you may not need a completely empty desktop, but ‘stacks’ may suffice, more on this below. 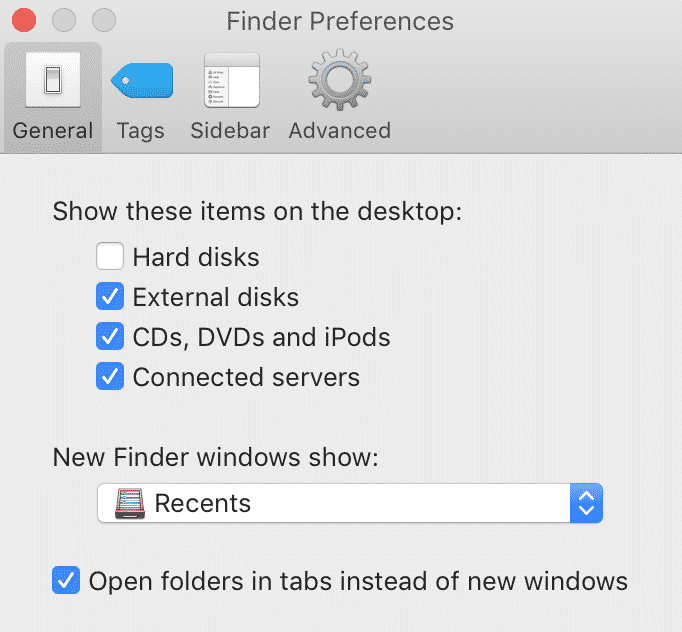 Easily navigating your desktop could be as easy as creating folders and organising all your scattered files into categories. If you’re a Mac user and are not too fussed about how things are sorted then you might be interested in ‘stacks’. This feature was made available by Apple in the Mojave update. To create these stacks, simply go to your desktop, right click and then select ‘Stacks’. There are some preset options available such as, sorting by kind, date last opened or tags. Mac desktop with stacks enabled. Nice and clean! For those who want a more specific filing system or are using Windows you may want to consider creating folders that make things neater and assist you when you do need to find that pesky file. For example, you may decide to create folders based on the file type, for example images, word documents, PDF’s, etc. Or maybe you might find it more useful to sort it by projects that you’re working on, or based on a particular time line, for example current, archive, for future reference, etc. In Windows, creating files on your desktop is simple, just right click the desktop and find ‘New’ and then ‘Folder’. This automatically creates a folder on your desktop which you can re-name straight away. Similarly on a Mac, to create a new folder right click on your desktop and select ‘New Folder’. For Windows computers when you install a new program or application, it invariably (see: annoyingly) ends up on your desktop. 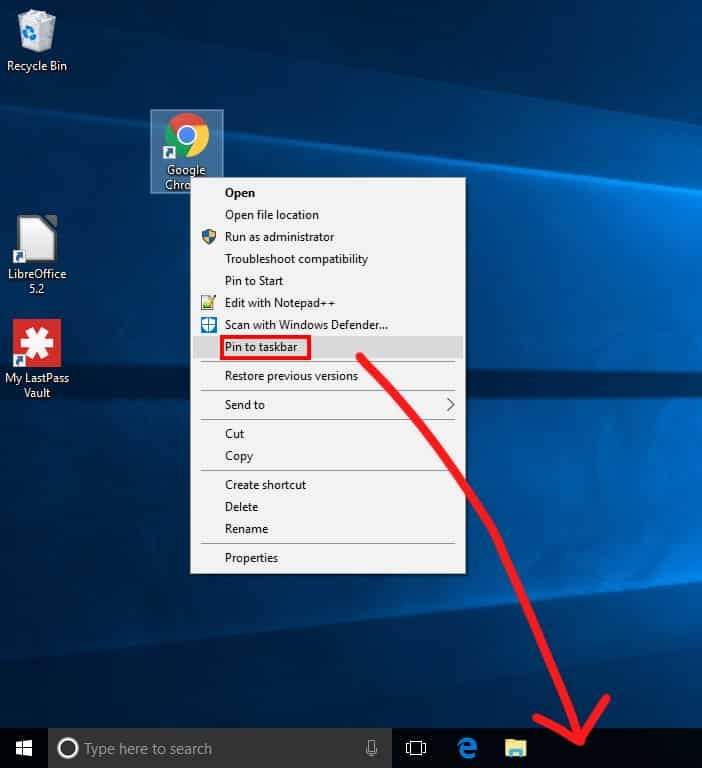 What you can do instead is get rid of any application shortcut that you aren’t using and pin the ones that you do use regularly on your taskbar. To pin: Simply right click on the application and select pin to taskbar. To delete: Make sure that it is in fact a shortcut but right clicking the icon and pressing ‘Properties’. If you see a tab named ‘Shortcut’ then the file you are trying to delete is in fact a shortcut and you can safely delete it. In addition, shortcuts are likely to have a small arrow in the bottom left hand corner of the icon. For Mac users there are a few things that will appear on your desktop by default that may not fit in with your chosen organisation method. To fix this go to your desktop, go to the top left hand corner and under ‘Finder’ select ‘Preferences’. This will pull up the below screen and you can untick the items that you do not want showing up by default. 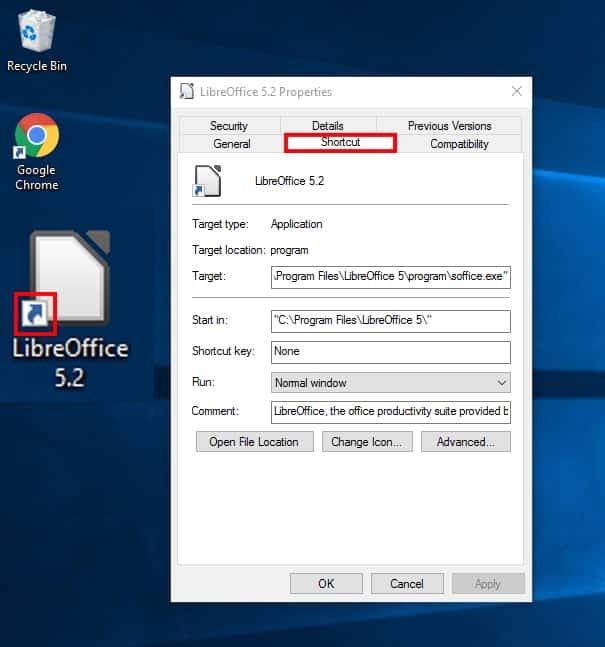 Keeping a weekly appointment to review any loitering files on your desktop could be the key to maintaining a clean desktop. Plus the cleaner it is, the easier it’ll be to find the files that you do need! Choose how often you want to clean your desktop for example, every month and set aside a small amount of time to delete any files that you no longer need. Schedule this as an recurring calendar appointment and you never know, seeing your whole desktop background might become a regular thing! If the sound of a scheduled clean up made your face scrunch up, then why not program something to do the clean up instead! For Windows there is a free but simple app that can help you with this called Desktop Cleanup. This application sorts files on your desktop to a particular folder based on its age. It’s not super high-tech and there are limited parameters, but if your main goal is to keep things tidy, then this is the program for you. 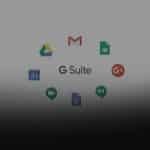 Unfortunately for Macs the most common free apps (Desktoday and Clean) are either not available in Australia or have bad ratings, so we can’t recommend these. If you are desperate for an app that allows you to automate the clean up of your desktop, there is Hazel, although it’ll cost you a pretty penny. That’s it! Hopefully one of these 5 tips has encouraged you to organise your desktop or even just give it a good spit and shine every so often!